The Chinese military has sent a clear message for the U.S. Navy in the South China Sea: Your FONOPs will not be fun ops. Now, it appears likely that China's aggressive naval ambitions may spread beyond its artificial islands to the country's nascent military presence in Africa. Just two days after the Navy destroyer USS McCampbell sailed near islands disputed in the South China Sea, People's Liberation Army Navy officer Senior Capt. Zhang Junshe issued a stern warning that the United States would be to blame for any kinetic encounter between U.S. and PLAN vessels — the latest in a series of escalating encounters between the two navies that included a suggestion from another senior Chinese military officer that their vessels should attack U.S. Navy ships outright. 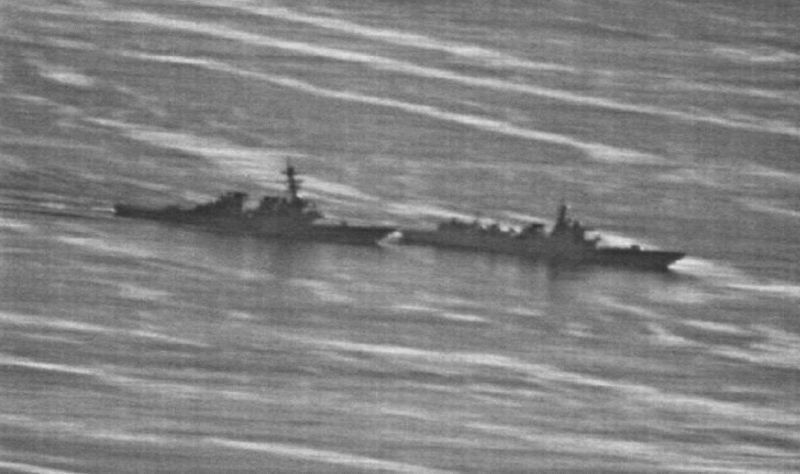 "Both countries warships definitely have to come into close proximity and it's easy for there to be a misunderstanding or an error of judgment, even a collision," Junshe, currently a researcher at the PLA Naval Military Studies Research Institute, told Reuters on Wednesday, a reference to the October 2018 near miss between two vessels. But while speaking to reporters on Wednesday, Junshe made the case for developing China's man-made islands in response to U.S. Navy FONOPs, a move that, as the Associated Press notes, runs counter to the 2015 pledge by Chinese President Xi Jinping to halt the development of airfields and other fortifications. "If our on-island personnel and installations come under threat in future, then we necessarily will take measures to boost our defensive capabilities," he said. The jousting between the PLAN and U.S. Navy in the South China Sea may be unsurprising, but the explicit development of military installations by the PLAN as a challenge to U.S. naval power likely won't certainly stay confined to the artificial islands there. In Djibouti, analysts see a one-year-old PLAN military base there as a signal of intent to militarize its growing influence in Africa and project naval power across the world — strategic elements that make the Horn of Africa the next locale for a Sino-U.S. clashes. China has shown intense interest for years in developing a foothold in the Horn of Africa, a critical strategic choke point not just for global trade, but for the U.S. counter-terror presence across the Middle East and North Africa. But in recent years, just as China was transforming reefs and sandbars into airstrips and fortifications in the South China Sea, the PLAN was laying the groundwork for a military expansion in Africa by gobbling up Djibouti's external debt, which has increased significantly since 2014, according to the Washington Post; three years later, the Chinese military established a base next to the Doraleh Multipurpose Port. "China's military involvement in the Horn of Africa, primarily consisting of anti-piracy missions, began a decade ago. Today, in addition to anti-piracy operations, declassified analysis from CNA posits that China's naval facility in Djibouti will support four other key missions: intelligence collection, non-combat evacuation operations, peacekeeping operation support, and counterterrorism," as Tyler Headley points out in The Diplomat. "All of these objectives are in line with a nascent but escalating policy of global military engagement stretching from the South China Sea to East Africa." While observers have fretted over the possibility of China supplanting the U.S. as the primary great power trade partner to the strategically-important country, Junshe's comments will likely reverberate from the South China Sea all the way to the Horn of Africa. Indeed, so-called "great power competition" that defines the current U.S. national security posture will only increase in the region, competition that will likely bring about the same naval encounters signaled by Junshe and other Chinese military officials. "Waterfront property in the African countries along the Red Sea seems to be an increasingly hot commodity," as Congressional Research Service analyst Lauren Ploch told Task & Purpose in early 2018. "The U.S. and France have had military facilities in Djibouti for over a decade, but the country is getting increasingly crowded. China just opened a base and Saudi Arabia is in talks for one." With Camp Lemonnier the only permanent U.S. military installation on the entire African continent and a key nerve center for U.S. counterterrorism operations conducted by Combined Joint Task Force-Horn of Africa, harassment by Chinese naval vessels may prove a undue burden to the U.S. military personnel deployed there. So, will the Chinese military eat Djibouti like groceries? Or will the U.S. Navy start digging in for some serious un-fun FONOPs? One thing is certain: I wrote this entire story just so I could use this headline.